Rocks and water were at the center of Frank Olin’s professional life. Not exactly mountains and beaches all the time, but he was riding a wave of success that was pushing his business, AQUAPro Systems, LLC, higher and higher up the hill. Then the real estate market collapse brought his customers to their knees – and some of them were not able to rise again. His wave of success slowed to a trickle. 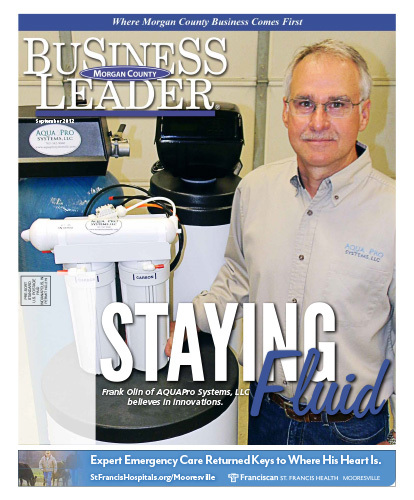 AQUAPro System, LLC was built on innovation and invention. Olin says his heritage was the foundation. He grew up working alongside his father in an electrical maintenance and repair business. He helped maintain industrial machines and apparatus including everything from gearboxes, bridge cranes and lift stations to wastewater treatment facilities. He got a degree from Purdue University in electrical engineering and technology. The next fifteen years he spent in the corporate engineering world including product development and sales. He even obtained a master electrician license. As a cog in the automotive world, he was stepping off airplanes around the world on a regular basis. It was at that point Olin declined a promotion and transfer to St. Louis. He wanted to get his feet planted back on the ground and keep his family in Martinsville. He had experienced the passion his father had for his small business and Olin wanted his own business and more out of life. He started out doing electrical troubleshooting for residential customers. Then, through a referral from his father, he took on a client in Minnesota troubleshooting and maintaining machines for their stone- cutting business. He discovered the need for a water reclamation system and developed a customized system for the client. The savings was immense because the water used in the cutting process could be fed through a closed loop recycling system. A filter press captured the solids to form a filtrate cake and the water was passed on for reuse. Utility bills dropped dramatically since less water was needed and the emission of the slurry water was eliminated improving the environmental impact. It wasn’t long before Olin was designing and manufacturing water reclamation and filtering systems throughout the nation for many businesses in the stonecutting industry. His company was growing and flourishing. Download the full September 2012 Edition here.